I discovered a rare & complete 'never before heard' Bob Dylan track on a reel to reel tape after a visit to the previously abandoned 'AIR Montserrat' recording studio. The Studio was once the tropical getaway to the stars of rock, run by George Martin of Beatles fame. Never before heard and completely unknown Bob Dylan track was recovered "This is a chord"
September 7, 2014. Brooklyn, New York. This never before heard and completely unknown Bob Dylan track was recovered from an Ampeg tape reel found in the abandoned shell of the AIR Monsterrat recording studio in the Summer of 2011. It is unclear how the track survived the after effects of Hurricane Hugo and the volcanic eruption on the island both of which damaged structures irreparably on the island. The "This is a Chord" Bob Dylan Rarity track was originally captured sometime between 1980 and 1986 according to notes on the found reel. The song title is initially unclear but likely the intended name from song listening is 'This is a Chord' and is unmistakably #BobDylan. It is a complete unit and seems to have been recorded in one take from start to finish with sparse guitar instrumentation as accompaniment. John visited the island of Montserrat on July 6th, 2011, on a day trip by boat from his home in Antigua W.I. He wanted to see where the great George Martin worked and lived. The island also has deep Irish roots with Irish people allowed to be free back in the days of 'indentured servitude' . They celebrate St Patrick's day and visitors get the green shamrock imprint on their passports on arrival. 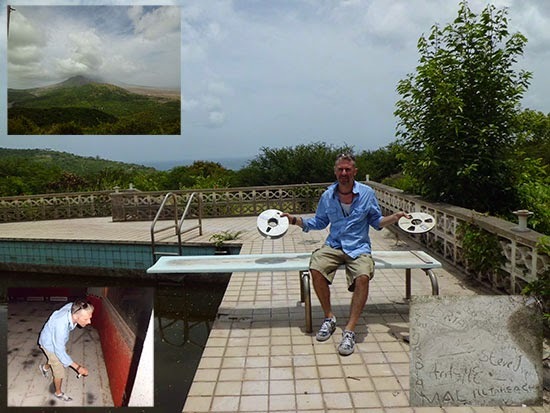 During the stay he visited the remains of the AIR Montserrat recording studio. It was in a pretty shambolic state after the eruption but the storeroom seemed to be intact apart from some gigantic scary frogs whose stirrings gave John quite a turn. He persevered on the magical mystery tour and found some abandoned reel to reels tapes still in their boxes. He also found the marks of other famous visitors some dried concrete paving stones with engravings of visitors- one seems logically like 'Mal' Evans - he being the long time member of the Beatles entourage doing percussion Alarm Clock on the interlude on the #Beatles 'Day in the life'. John was concerned that the exit process of Xrays from various travel trips would wipe the tape and as it happened this was the only recoverable item on the tape. It was a long difficult but worthwhile process to recover the track intact. The track recovery done at the insistence of his wife (Yes, dear!) and a very helpful friend in the production industry with some old skool reel to reel equipment. "there might be something fantastic there"
turned out to be correct. John just expected a McCartney cast off not a never-before-heard and a 'Classic' #BobDylan song.